The Pacific Giant Salamander is a large charismatic salamander that can grow up to 30 cm in length. This marbled golden brown salamander is the only member of the family Dicamptodontidae that occurs in Canada. The species’ range extends from extreme southwestern British Columbia through western Washington and Oregon to northwestern California. In Canada, the species is largely restricted to the Chilliwack River drainage in British Columbia. It is currently known from about 75 streams and tributaries within 15 stream systems. 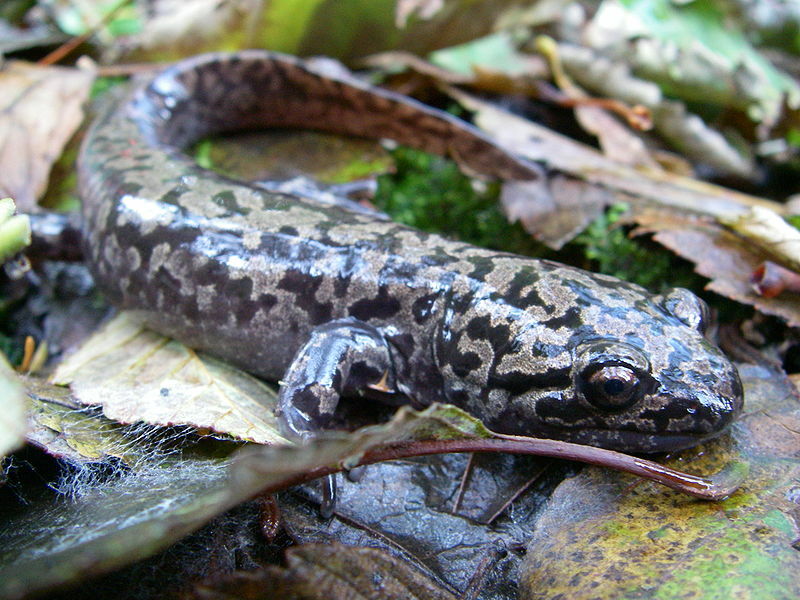 Because of the species’ restricted Canadian distribution and threats to its habitat from forestry, urban developments, road building, and other human activities, the Committee on the Status of Endangered Wildlife in Canada (COSEWIC) reassessed the national status of the Pacific Giant Salamander changing it from “Special Concern” to “Threatened” in 2000. The species is on the provincial Red list in British Columbia and is listed as Threatened under Schedule 1 of the federal Species at Risk Act (SARA). As well, the Conservation Framework has assigned Pacific Giant Salamanders a conservation priority 1, the highest priority rank under Goal 3: Maintain the diversity of native species and ecosystems (Ministry of Environment 2010a). Characteristics of the species’ life history and ecology that contribute to the vulnerability of populations and influence their recovery potential include limited dispersal ability both in aquatic and terrestrial habitats; complex life history; low reproductive potential; and close association with cool, clear headwater streams and creeks. 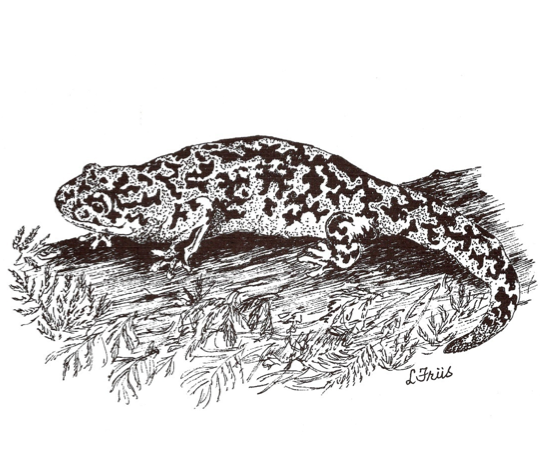 The Pacific Giant Salamander has a complex life history, which includes an aquatic and a terrestrial phase. The habitat needs of all life stages must be met for populations to persist. The salamanders typically inhabit small, cascading streams and adjacent moist, shaded forest. Aquatic larvae spend several years in the streams, where they shelter under rocks in small pocket pools of calmer water and feed on aquatic invertebrates. Adults live in moist, shaded forest, close to streams and require either abundant coarse woody debris, or other shelter on the forest floor. Under some circumstances larvae attain maturity without transforming and remain permanently aquatic; this process is termed neoteny. 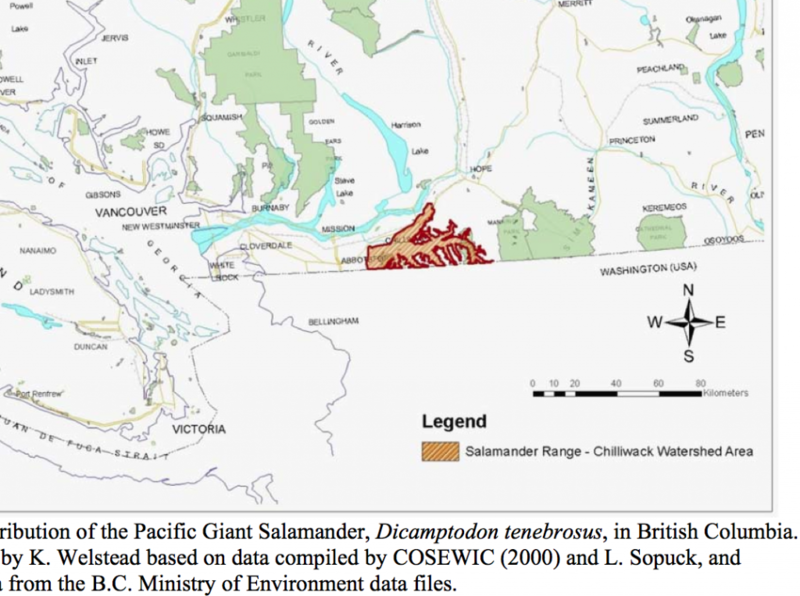 The recovery goal is to ensure a well-connected, viable, and self-sustaining population of the Pacific (= Coastal) Giant Salamander (Dicamptodon tenebrosus) within secure habitat1 throughout its known range2 in Canada where habitat still exists or can be restored (achieve within 10 years). The short-term (5-year) objectives focus on securing known populations, preventing fragmentation, inventorying for unidentified populations, and restoring historical populations through management and protection of survival, recovery, and dispersal habitats in the aquatic and terrestrial environments. 1 “Secure habitat” is suitable habitat that is managed to maintain the species for a minimum of 100 years and includes suitably connected breeding, foraging, overwintering, and dispersal habitat. 2 “Known range” areas will include both occupied habitat and historically occupied habitat including streams and drainages where the species occurs naturally and was confirmed to occur in the past. It includes both streams where records of the species exist and streams in the same drainages that contain high-quality, unsurveyed habitat. This area may expand as new localities are discovered. The broad strategies or approaches for recovery consist of habitat protection, management and stewardship, habitat mapping, population inventories, habitat restoration, population and habitat monitoring, threat clarification, research, outreach, and stewardship. Although no critical habitat as defined under SARA is proposed for identification at this time, continued habitat protection is urgent for occupied sites as only 40% of the occupied sites are conserved in parks, protected areas, community watersheds, and Wildlife Habitat Areas. Currently 20 Wildlife Habitat Areas have been approved encompassing approximately 38 km (linear) of known occupied streamside habitat in the Chilliwack Forest District (Ministry of Environment 2010b; see Appendix 2). Increasing survey coverage is also urgent, as less than 20% of potential stream habitat has been surveyed to date. Habitat on private lands can be conserved through stewardship, including working with municipal and regional governments to achieve habitat objectives at landscape and broader levels. A draft action plan has been developed and will be updated after the posting of the recovery strategy.